Renewal period ended Feb. 28. Renewal for all Professional Engineers and engineering firms licensed in Florida ended Feb. 28, 2019. If you did not renew your Florida PE license or Certificate of Authorization by Feb. 28, 2019, then your license is now delinquent. If your license is currently delinquent and you do not renew in this cycle, your license status will become null and void on Feb. 28, 2021, and you will need to apply for a new license. The cost of renewing your delinquent license for the 2019-21 biennium is $123.75, which includes the renewal fee of $98.75 (including a mandatory $5 unlicensed activity fee), and a delinquent fee of $25. If you have a DBPR account that was set up during a previous renewal, you do not need to set up another account. Go to myfloridalicense.com and log into your existing account. If you have never renewed your license online, you must have your Social Security number in DBPR’s licensing system in order to set up your account. If the number in the database is incorrect, the system will not allow you to set up your account. If you experience any problems, please call the Board office at (850) 521-0500 and select “Renewal” to speak to a representative. If you obtained your Florida PE license by examination in April 2017, October 2017, or April 2018, and Florida is your first state of PE licensure, you are required to pay only the fee to renew your license. You do not need to complete the 18 hours of continuing education for this renewal cycle. However, effective with the 2019-21 biennium, you will be responsible for completing your continuing education hours and paying the renewal fee to successfully renew your license. If licensure was achieved in Florida by Endorsement (Comity) during a current biennium, the licensee IS REQUIRED to complete all continuing education requirements and pay the renewal fee. To view the continuing education requirements for Florida licensees, please refer to the Continuing Education section of our website. 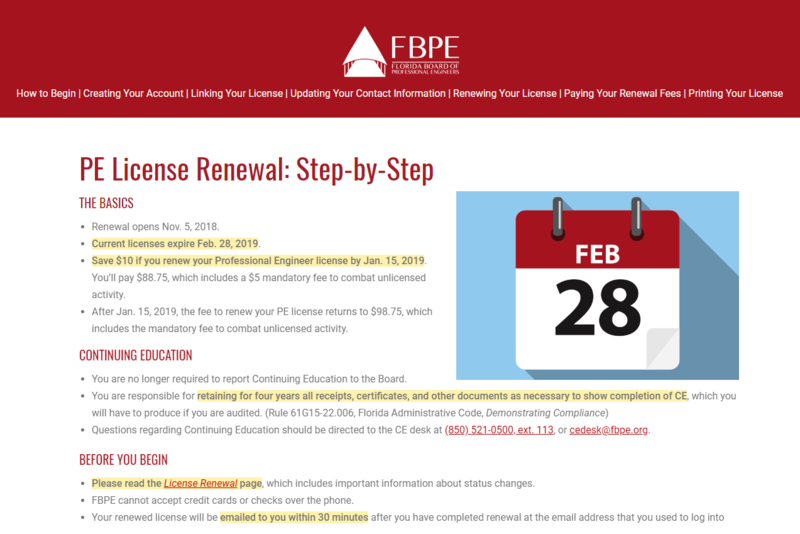 If you have any questions about renewing your license, please call us at (850) 521-0500, and select Renewal to speak to a representative, or email renewal@fbpe.org. Continuing Education Requirement: All licensed PEs in Florida are required to complete 18 hours of continuing education (CE) in order to renew their licenses. Rule 61G15-22.001, F.A.C., requires 18 hours of continuing education to include one hour of Florida laws and rules, one hour of professional ethics, and four hours of area of practice. The remaining 12 hours may be related to any topic pertinent to the practice of engineering. Read the Continuing Education Requirements page to understand your responsibilities regarding CE and CE record keeping. Certificate of Authorization Holders: The qualifying engineer (PE) must renew his or her license first before attempting to renew the Certificate of Authorization (CA). If the qualifying engineer renews his or her license after the CA has been renewed, the certificate will not renew. If you hold a CA for your company, check the status on DBPR’s website, myfloridalicense.com. If the CA status does not show as renewed and both the qualifying engineer and CA have paid renewal fees, you must contact the Board office at (850) 521-0500 and select “Renewal” to have this corrected. Printing Licenses and Certificates of Authorization: All Florida PE licenses and Certificates of Authorization are only available for printing online. PE licenses and CAs will no longer be mailed. Go to myfloridalicense.com and log into your account. The licenses linked to your account will appear on the right side of the Main Menu page. Select the license or CA that you would like to print, then under Functions on the License Menu page, select “Print License Certificate” and follow the prompts. A PDF of the license will be sent within 30 minutes to the email address associated with your account (the one you used to log into your account). Use the PDF to print your license. For step-by-step instructions, see How Do I Print My License? Replacement Wall Certificates: With online printing of licenses and CAs now available, only duplicate wall certificates will be available for order from FBPE. See the Other Forms page under Licensure. Attestation Statements: Each licensee will be required to attest to the accuracy of your licensure information, completion of CE for the renewal period, and reporting of any disciplinary action that may have been taken against your license in another jurisdiction. You will not be able to successfully renew your license without providing a response to these statements. Receipts: You should receive an automatic email from the DBPR licensing system confirming that your renewal application has been received. This email will contain an Online Payment Summary in the form of a PDF attachment. This may serve as a receipt. Delinquent/Active Licensees: If your license has a current status of delinquent/active and you wish to renew your license, you must complete the 18 hours of Continuing Education from the previous renewal cycle, plus the 18 hours of CE for the current renewal cycle. Each 18 hours includes one hour of Florida laws and rules, one hour of professional ethics, four hours related to your area of practice, and 12 hours related to any topic pertinent to the practice of engineering. Also, if you did not pay to renew your license during the past renewal cycle, then the total amount due is $222.50, which includes the $98.75 fee for the previous cycle, a delinquent fee of $25, and the $98.75 fee for the current renewal cycle. Or, if you paid your renewal fee during the previous cycle, but have a delinquent/active license, then the total amount due is $123.75, which includes the $98.75 renewal fee for the current cycle, and a delinquent fee of $25. Null & Void Licensees: If your license is currently delinquent and you do not renew in this renewal cycle, your license status will become null and void on March 1, 2019. A license status of null and void means your license and license number will no longer be valid. To obtain a new Florida PE license, you must reapply through the endorsement process. Information regarding the endorsement process is available on our website under Endorsement in the Licensure: Application Process section. Current Inactive Licensees: If your license is currently in inactive status, and you want to become active, you may renew your license online. Complete the renewal process by going to myfloridalicense.com, and selecting “Renew Your License” or “Licensee Login.” After you have renewed and paid your $98.75 fee, contact the Board office at (850) 521-0500, ext. 113, to obtain further instructions on how to change your license status back to active. Note: You may be required to demonstrate that you have completed the 18 hours of continuing education requirement if your license has been inactive for more than a year. Active to Inactive License Status Change: In order to place your license in an inactive status during the current renewal period, you MUST pay the renewal fee of $98.75. You will not be required to take any continuing education hours. You will then need to request that your license be placed in inactive status by submitting the Application for Change of Status Form – Active to Inactive application to change your license status. Go to the Other Forms page under the Licensure section of our website and download the application. Be sure you have read and understand the requirements of Rule 61G15-22.001, F.A.C., regarding activating your license before your request an inactive status. Should you decide to activate your license, you will be required to submit the Application for Change of Status Form — Inactive to Active with all required documents, pay any additional licensure fees necessary to equal those imposed on an active status licensee, pay any applicable reactivation fees as set by the Board and meet all continuing education requirements as defined in Rule 61G15-22.001, F.A.C. Retired Status Change: As a Florida licensed professional engineer if you are no longer actively practicing engineering, you can apply to retire your license. Retiring your license means that you are willing to relinquish your license, not renew, and that you will refrain from practicing engineering and using your seal.To retire your license, you must complete the Application for Retired Status and submit it to FBPE for Board approval. All applications for Retired Status must be approved by the Board. This requires that your name be placed on the Retired Status List on the Board agenda at each Board meeting. The Board meets in February, April, June, August, October, and December. Applications must be submitted at least 30 days prior to the Board meeting. The Board meeting dates can be found on the Calendar under Meetings and Agenda section of this website. During the renewal process, if you submit your Retired Status Application after Jan. 15, your license will show delinquent until the application is approved at the next Board meeting. Once you have been approved and your license is officially in a retired status, your licensure record will be updated to reflect “PE, Retired.” Retired licensees can refer to themselves as “Professional Engineer, Retired” or “PE, Retired,” but cannot engage in any engineering practice. Should you decide to return to active practice, you will need to complete and submit a new application for licensure under the Florida licensing requirements in effect at the time you apply. Note: Your previously held PE number cannot be reinstated once retired. If your new application for licensure is approved, a new PE license number will be issued. If you are unsure about retiring your license, you may consider requesting to have your license made inactive. If you have questions related to either of these processes, please contact the Board office at (850) 521-0500, ext. 114. Be registered as a continuing education provider with the Registered Continuing Education Program (RCEP) or the American Council of Engineering Companies (ACEC). Can I use CE credit obtained for my other licenses towards the CE requirement for my Florida license? With the exception of the one hour Florida laws and rules and professional ethics CE requirement, you may apply continuing education credit earned for another state’s engineering license to your remaining 16 hours, assuming it meets the criteria set forth in Section 471.017, F.S., Renewal of License, and Rule 61G15-22.001, F.A.C., Continuing Education Requirements. In addition, pursuant to Rule 61G15-22.011, F.A.C., only Board-approved providers may offer continuing education courses and credit. A list of Board-approved CE providers and courses can be found on myfloridalicense.com. If you are unsure if a provider or course is approved or acceptable, call the Board office at (850) 521-0500, and select “Continuing Education” for assistance. Can I fax or email my certificates for my continuing education to the Board? No. You are no longer required to report continuing education to the Board. Pursuant to Rule 61G15-22.006, F.A.C., Demonstrating Compliance, the licensee is responsible for retaining receipts, certificates, or other documentation, as proof of continuing education in the event you are randomly audited. You must retain these records for four years from the date of completion of the continuing education activity. For more information related to continuing education and CE provider requirements, go to the Continuing Education page on our website. Pursuant to section 455.02(1), F.S., any member of the Armed Forces of the United States may request that his or her professional license be placed in a military status, without paying dues or fees, or performing any other act such as continuing education. This status will remain in effect for as long as he or she is a member of the U.S. Armed Forces on active duty and for a period of six months after discharge from active duty as a member of the Armed Forces of the United States, if he or she is not engaged in his or her licensed profession or vocation in the private sector for profit. For instructions on renewing your Professional Engineer license, visit FBPE’s guide, PE License Renewal: Step-by-Step. We recommend keeping the guide open for reference in a separate browser window as you renew your license. The steps included in the guide can also be used to renew your firm’s Certificate of Authorization (but please remember to renew the PE license of your Engineer of Record first or else the CA will not renew). If you experience any issues accessing your account, please contact the Board office at (850) 521-0500, and select “Renewal” to speak to a representative. FBPE answers calls from 8 a.m. to 5 p.m. Eastern Time Monday through Friday (excluding holidays). Create or update your online license account at myfloridalicense.com. Verify your contact information is correct and contains a valid email address and a current physical mailing address. We send notifications and updates to the email address and mailing address on file. You will not receive important licensure information if your contact information is out of date. Link an existing license or certificate of authorization to your online profile (if applicable). Ensure you have completed the 18 hours of required continuing education by Feb. 28, 2019, and that your records are complete. Read the Continuing Education Requirements page to understand your responsibilities regarding CE and CE records. Have one of the following acceptable forms of payment available: American Express, Discover, VISA, MasterCard, or electronic check payment (ACH).